I have been living at ISH for less than two weeks, yet I feel very at home here already. The experience of getting to know more about the House and meeting other residents happened simultaneously with full days of orientation for my graduate school program at Georgetown. 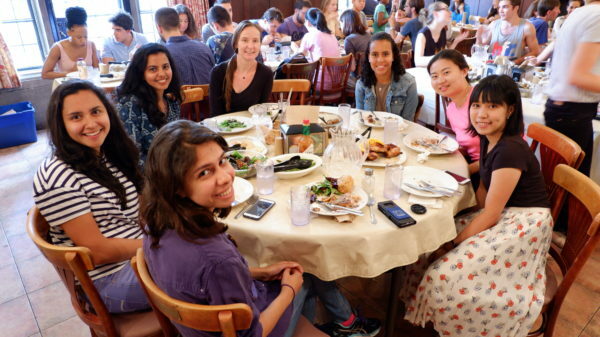 Though I met many residents in the dining hall and common areas in the early days, what stands out in my memory as my official welcome into the ISH community was my first Sunday dinner. Every Sunday at 1pm sharp, everyone in the house comes together for a family style meal. When I came downstairs and found a seat at a table with food, plates and silverware it made me think back to meals I would have with my family growing up. As someone who has been a student, living away from home for over six years now, it is not often that I share a meal with people sitting around a table at a specified time. And it was very cool to see so many members of the ISH community together at once. While I appreciate the flexibility of eating dinner during the week at whatever time works best for us, there is something special about Sunday dinners. At my first one each of the (many) new residents stood up and introduced themselves and outgoing residents stood up and said something about their time at the House. After a moment of silence (per ISH tradition) we all sat down and began the meal, passing around dishes of delicious food. Meal times have really been a key way for me to get to know people at ISH. I have really enjoyed sitting down amongst people I have not talked to much yet and learning about their story – where they’re from, what they’re doing here in D.C., how long they’ve been at ISH. I have found that my interest in international diplomacy and foreign service is commonly shared by many residents of the House. Though I have learned a lot about U.S. foreign service through the Rangel Fellowship program, it has been interesting to learn about public service careers in other countries. Every time I catch up with friends and family from home I tell them about the most recent interesting fact I learned at ISH, like that the U.S. Embassy in Baghdad is the largest embassy in the world or that Singapore has one of the lowest crime rates in the world. I have had the opportunity to get to know more residents outside of meal times as well. Last weekend I went with a group of ISH residents to see a Redskins (American) football game. I would have never guessed that my first time going to a NFL football game would be with a such an internationally diverse group. Though I am not a big football fan, the time to chat with residents during the journey to the stadium and the experience of watching the game together was a great time. Another memorable event was a discussion hosted at ISH featuring Benjamin Wittes, a senior fellow at the Brookings Institution, about the constitutional issues at stake in the investigation of the U.S. President. There is always so much going on at ISH, I look forward to meeting more people and the many fun events to come. 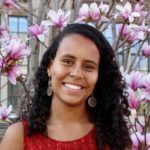 Bio: Zinna is an Ethiopian-American student at Georgetown University’s School of Foreign Service where she is pursuing a Master’s degree in Global Politics and Security. She is originally from Wheaton, Illinois but most recently lived in New Jersey where she completed a Bachelor’s Degree in Sociology with a minor in French Language and Culture at Princeton University. Zinna studied abroad at the Sorbonne University in Paris in the spring of 2016 and interned at an international law NGO in Paris called the Union Internationale des Avocats. The summer of 2016 she was a campaigns intern for the Young African Leaders Initiative Network Program under the Bureau of International Information Programs in Washington, DC. Most recently she was an intern for the Tom Lantos Human Rights Commission on Capitol Hill. Zinna is a 2017 Charles B. Rangel International Affairs Fellow and will focus on Public Diplomacy as a U.S. Foreign Service Officer upon completion of graduate school. She hopes to concentrate on issues related to the rights of women and girls, education, and human rights in Sub-Saharan Africa.